Under Saracens, Byzantines, and Venetians. Island in the Mediterranean, about 55 miles south of the Morea. Jews had settled there long before the Christian era (I Macc. xv. 23 mentions Jews in Gortynia, Crete). Philo speaks of the Jews of Crete ("Legatio ad Caium," ed. Mangey, ii. 587). About 4 B.C. the false Alexander, on his way to Rome, visited the Jewish communities of Crete, which, believing him to be a scion of the Hasmoneans, provided him with large sums of money (Josephus, "Ant." xvii. 12, § 1). Cretan Jews residing in Jerusalem are mentioned in Acts ii. 11. Crete fell into the hands of the Romans in 67 C.E. ; and the Jewish communities there shared the fate of others under the dominion of Rome: they were treated as Roman citizens under the pagan emperors, but became the objects of persecution as soon as Christianity had become established. Thus, under Theodosius II. 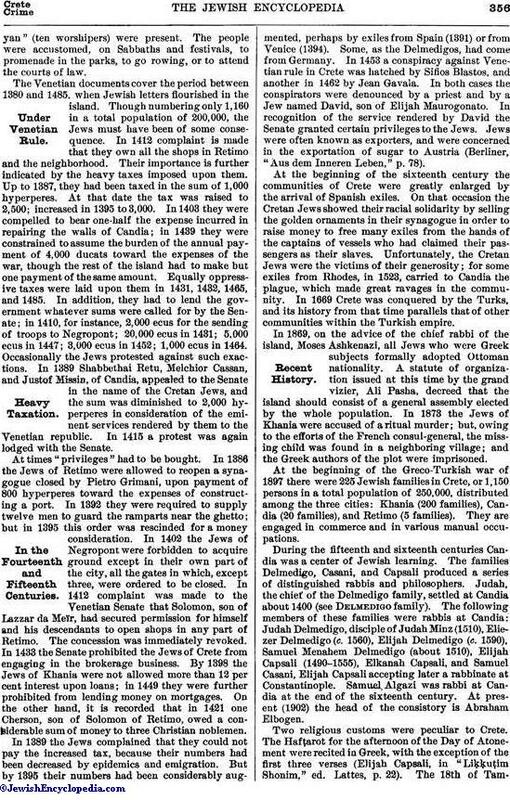 (408), the Cretan Jews were expelled. The period of their banishment, however, must have been of very short duration; for it is recorded that in 440 a pseudo-Messiah arose among them, and that the faith of the Cretan Jews in him was so great that they neglected their business, abandoned their property, and waited for the day on which the new Moses would lead them dry-shod through the sea into the Promised Land (Socrates, "Historia Ecclesiastica," vii. 36). In 823 Crete fell into the hands of the Saracens, but nothing is known of the fate of the Jews at that time. The island was reconquered in 960 by the Byzantines, who held it until 1204, when it was sold by the Marquis of Montferrat, to whose lot it had fallen, to the Venetian republic. An insight into the history of the Jewish communities of Crete during the thirteenth, fourteenth, and fifteenth centuries can be gotten partly from an interesting series of communal regulations issued in 1328, and partly from documents in the archives of Venice, published by Hyppolyte Noiret in the "Bibliothéque des Ecoles Françaises d'Athenes et de Rome." The regulations give the 15th of Elul, 1228, as the date of their proclamation in the synagogue, but Güdemann has shown that the date must be the 16th of Elul, 1328. They were reenacted at a later date by a certain Rabbi Ẓedaḳah. They speak of four congregations in the island, at the head of which were three leaders ( ). One of the synagogues was named "Elijah the Prophet." 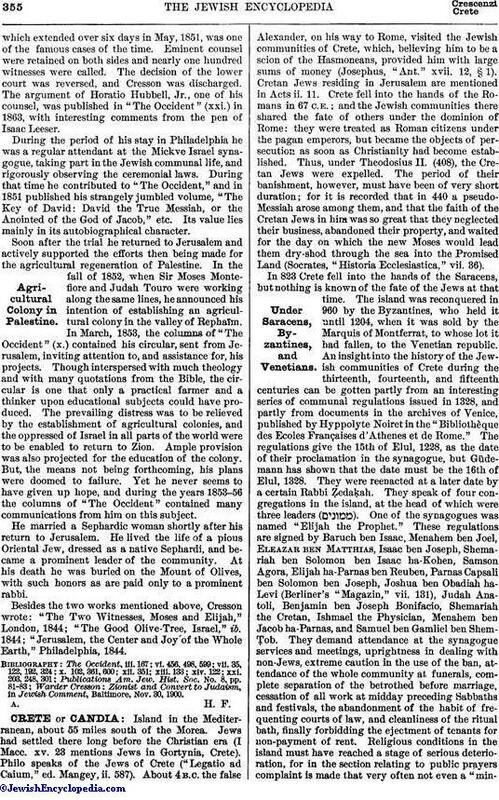 These regulations are signed by Baruch ben Isaac, Menahem ben Joel, Eleazar Ben Matthias, Isaac ben Joseph, Shemariah ben Solomon ben Isaac ha-Kohon, Samson Agora, Elijah ha-Parnas ben Reuben, Parnas Capsali ben Solomon ben Joseph, Joshua ben Obadiah ha-Levi (Berliner's "Magazin," vii. 131), Judah Anatoli, Benjamin ben Joseph Bonifacio, Shemariah the Cretan, Ishmael the Physician, Menahem ben Jacob ha-Parnas, and Samuel ben Gamliel ben Shem-Ṭob. 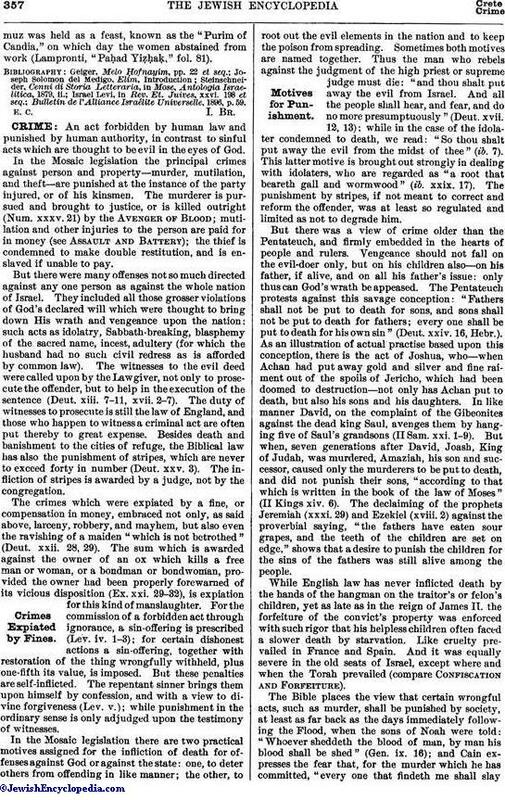 They demand attendance at the synagogue services and meetings, uprightness in dealing with non-Jews, extreme caution in the use of the ban, attendance of the whole community at funerals, complete separation of the betrothed before marriage, cessation of all work at midday preceding Sabbaths and festivals, the abandonment of the habit of frequenting courts of law, and cleanliness of the ritual bath, finally forbidding the ejectment of tenants for non-payment of rent. Religious conditions in the island must have reached a stage of serious deterioration, for in the section relating to public prayers complaint is made that very often not even a "minyan"(ten worshipers) were present. The people were accustomed, on Sabbaths and festivals, to promenade in the parks, to go rowing, or to attend the courts of law. The Venetian documents cover the period between 1380 and 1485, when Jewish letters flourished in the island. Though numbering only 1,160 in a total population of 200,000, the Jews must have been of some consequence. In 1412 complaint is made that they own all the shops in Retimo and the neighborhood. Their importance is further indicated by the heavy taxes imposed upon them. Up to 1387, they had been taxed in the sum of 1,000 hyperperes. At that date the tax was raised to 2,500; increased in 1395 to 3,000. In 1403 they were compelled to bear one-half the expense incurred in repairing the walls of Candia; in 1439 they were constrained to assume the burden of the annual payment of 4,000 ducats toward the expenses of the war, though the rest of the island had to make but one payment of the same amount. Equally oppressive taxes were laid upon them in 1431, 1432, 1465, and 1485. In addition, they had to lend the government whatever sums were called for by the Senate; in 1410, for instance, 2,000 ecus for the sending of troops to Negropont; 20,000 ecus in 1431; 5,000 ecus in 1447; 3,000 ecus in 1452; 1,000 ecus in 1464. Occasionally the Jews protested against such exactions. In 1389 Shabbethai Retu, Melchior Cassan, and Justof Missin, of Candia, appealed to the Senate in the name of the Cretan Jews, and the sum was diminished to 2,000 hyperperes in consideration of the eminent services rendered by them to the Venetian republic. In 1415 a protest was again lodged with the Senate. At times "privileges" had to be bought. In 1386 the Jews of Retimo were allowed to reopen a synagogue closed by Pietro Grimani, upon payment of 800 hyperperes toward the expenses of constructing a port. In 1392 they were required to supply twelve men to guard the ramparts near the ghetto; but in 1395 this order was rescinded for a money consideration. In 1402 the Jews of Negropont were forbidden to acquire ground except in their own part of the city, all the gates in which, except three, were ordered to be closed. In 1412 complaint was made to the Venetian Senate that Solomon, son of Lazzar da Meïr, had secured permission for himself and his descendants to open shops in any part of Retimo. The concession was immediately revoked. In 1433 the Senate prohibited the Jews of Crete from engaging in the brokerage business. By 1398 the Jews of Khania were not allowed more than 12 per cent interest upon loans; in 1449 they were further prohibited from lending money on mortgages. On the other hand, it is recorded that in 1421 one Cherson, son of Solomon of Retimo, owed a considerable sum of money to three Christian noblemen. In 1389 the Jews complained that they could not pay the increased tax, because their numbers had been decreased by epidemics and emigration. But by 1395 their numbers had been considerably augmented, perhaps by exiles from Spain (1391) or from Venice (1394). Some, as the Delmedigos, had come from Germany. In 1453 a conspiracy against Venetian rule in Crete was hatched by Sifios Blastos, and another in 1462 by Jean Gavala. In both cases the conspirators were denounced by a priest and by a Jew named David, son of Elijah Maurogonato. In recognition of the service rendered by David the Senate granted certain privileges to the Jews. Jews were often known as exporters, and were concerned in the exportation of sugar to Austria (Berliner, "Aus dem Inneren Leben," p. 78). At the beginning of the sixteenth century the communities of Crete were greatly enlarged by the arrival of Spanish exiles. On that occasion the Cretan Jews showed their racial solidarity by selling the golden ornaments in their synagogue in order to raise money to free many exiles from the hands of the captains of vessels who had claimed their passengers as their slaves. Unfortunately, the Cretan Jews were the victims of their generosity; for some exiles from Rhodes, in 1523, carried to Candia the plague, which made great ravages in the community. In 1669 Crete was conquered by the Turks, and its history from that time parallels that of other communities within the Turkish empire. In 1869, on the advice of the chief rabbi of the island, Moses Ashkenazi, all Jews who were Greek subjects formally adopted Ottoman nationality. A statute of organization issued at this time by the grand vizier, Ali Pasha, decreed that the island should consist of a general assembly elected by the whole population. In 1873 the Jews of Khania were accused of a ritual murder; but, owing to the efforts of the French consul-general, the missing child was found in a neighboring village; and the Greek authors of the plot were imprisoned. At the beginning of the Greco-Turkish war of 1897 there were 225 Jewish families in Crete, or 1,150 persons in a total population of 250,000, distributed among the three cities: Khania (200 families), Candia (20 families), and Retimo (5 families). They are engaged in commerce and in various manual occupations. During the fifteenth and sixteenth centuries Candia was a center of Jewish learning. The families Delmedigo, Casani, and Capsali produced a series of distinguished rabbis and philosophers. Judah, the chief of the Delmedigo family, settled at Candia about 1400 (see Delmedigo family). The following members of these families were rabbis at Candia: Judah Delmedigo, disciple of Judah Minz (1510), Eliezer Delmedigo (c. 1560), Elijah Delmedigo (c. 1590), Samuel Menahem Delmedigo (about 1510), Elijah Capsali (1490-1555), Elkanah Capsali, and Samuel Casani, Elijah Capsali accepting later a rabbinate at Constantinople. Samuel Algazi was rabbi at Candia at the end of the sixteenth century. At present (1902) the head of the consistory is Abraham Elbogen. Two religious customs were peculiar to Crete. The Hafṭarot for the afternoon of the Day of Atonement were recited in Greek, with the exception of the first three verses (Elijah Capsali, in "Liḳḳuṭim Shonim," ed. Lattes, p. 22). The 18th of Tammuzwas held as a feast, known as the "Purim of Candia," on which day the women abstained from work (Lampronti, "Paḥad Yiẓaḳ," fol. 81). Bulletin de l'Alliance Israélite Universelle, 1896, p. 59.